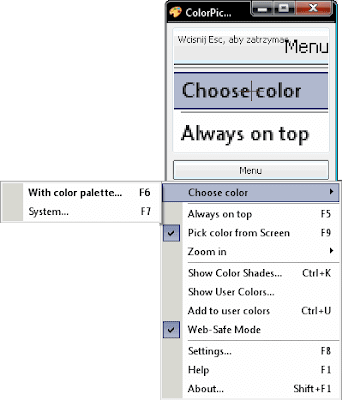 Application ColorPicker is a tool to select colors that will be useful mainly webmasters and developers, but it may be useful to other Users, however, also helping in the selection of the chosen color scheme or pattern of Windows. The application code chosen color standards Hex, RGB, HSV, CMYK, HTML, C + +, Delphi and Visual Basic along with the information, whether the color belongs to a secure Web color palette. In addition to the above formats users can define their own, so that the format can be adapted to the color used by any application or programming environment. It is also possible to load the color palette or directly from the screen at the same time increase its part indicated with cursor. For each collection of color it is possible to display shades of color which allows for easier selection of colors in the application. * Free for personal use and commercial use. Welcome to the collection use and testing! Great program not only for web designer!